Renaming the Round the Year Quilt…and… A Surprise! As promised in my previous post, here is the link to Sobana’s blog, The Quilt Bug, where you can see more pics of her awesome Round the Year quilt. ( While you are there, you must see the other awesome work she has been doing!) As I told you she is the first person I know to have finished the quilt, and that includes me. Sobana is of the opinion that I should rename the quilt to something short and sweet, something catchy, instead of `Round the Year’ which was okay when it was a Block of the Month but too vague otherwise. Eventually, I do plan – when I have the time ( when does one ever have the time?) – to make an e-book including all the block patterns, layouts etc in one place. So I am now veering around to her way of thinking. Her suggestions include “Starstruck’ and ‘ Milky way’ and ‘Dreamcatcher’. I love the name ‘Dreamcatcher’, but I was also considering ‘Mandala’, because it has an Indian flavour! Which of these names do you like? Or do you have a suggestion of your own? Do get back to me in the comments section by the 31st of December. Who knows, the New Year may get you a surprise gift from me if I choose the name suggested by you! 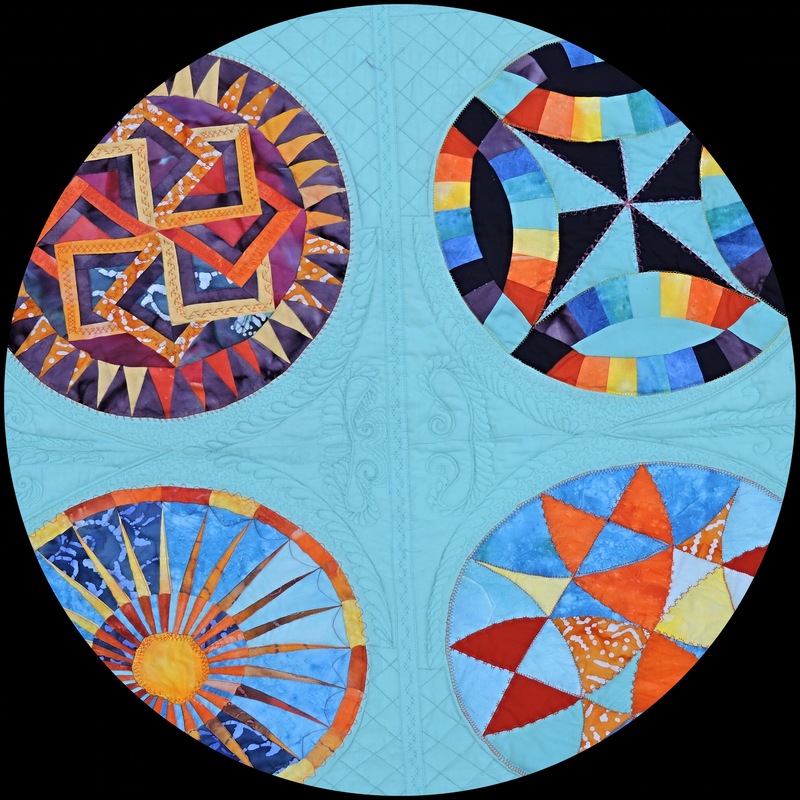 Author MadsPosted on December 20, 2015 April 13, 2018 Format AsideCategories Patchwork of my life, Round the Year quiltTags Dreamcatcher Quilt4 Comments on Renaming the Round the Year Quilt…and… A Surprise! The Round the Year Quilt – First on the Finishing Line! I am so, so proud to present to you the first completed Block of the Month Round the Year quilt – by Sobana Sundar. Those of you who have been following the quilt would know she tested many of the blocks for me. 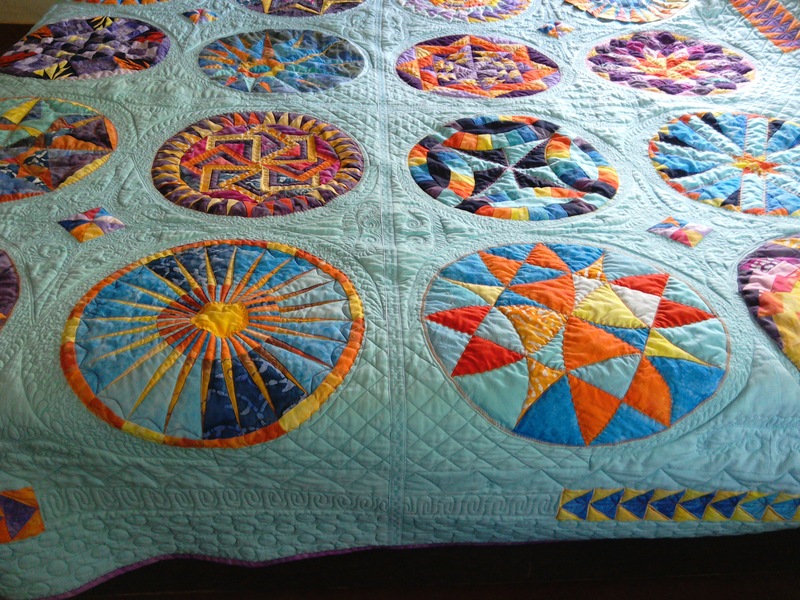 Sobana Sundar’s Round the Year quilt follows the Dusk colourway. Many of her fabrics are handpainted by her. A few are batiks. Sobana used the Layout Option 2, modifying it somewhat as she wanted to use the quilt-as-you-go (QAYG ) method to quilt it. She joined the blocks in four square (2×2) panels and added the borders on two adjoining edges on each panel. She then quilted these panels before joining them. She will be doing a blogpost on her own blog. Once that is done, I will add a link here! Isn’t it just gorgeous? 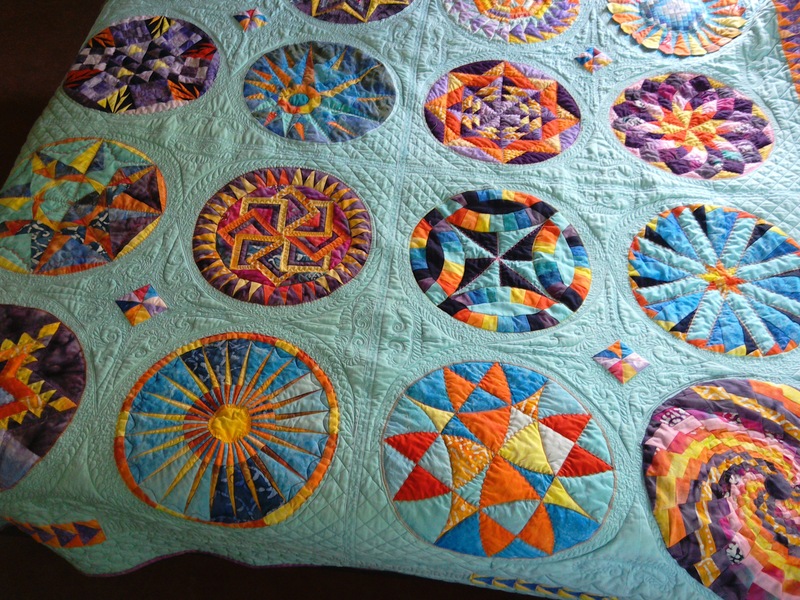 Her beautiful quilting has added so much to the design. Here is another look at the quilting! Another look at the gorgeous quilting! 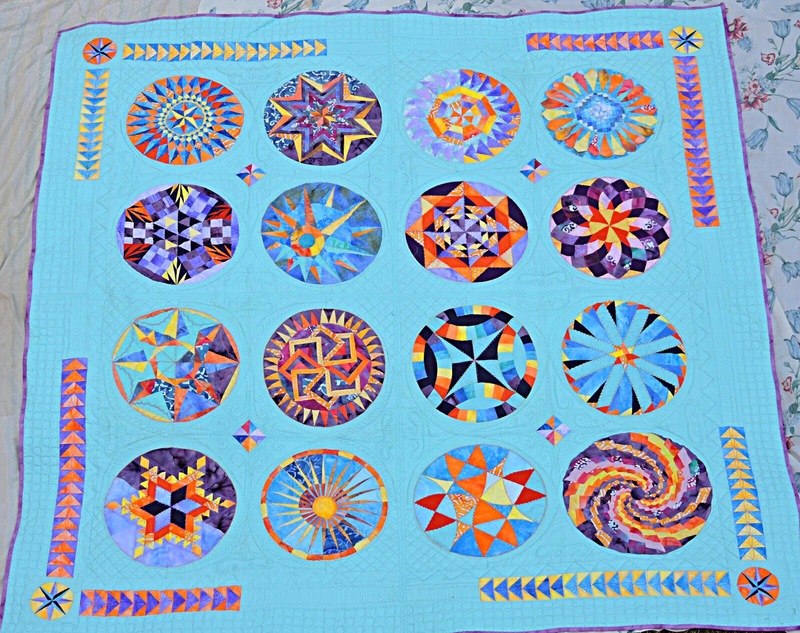 You can make your own quilt, using the free block patterns with tutorials for each, which were published on this blog July 2014 onwards. All the links are available here. If you make your quilt, or even a few blocks, please post the pictures on my facebook page ‘Patchwork of My Life’! I look forward to that! Author MadsPosted on December 15, 2015 April 13, 2018 Categories Patchwork of my life, Round the Year quiltTags Dreamcatcher Quilt, finishes Round the Year, Round the Year Layout Option 2, Round the Year quilt, Sobana's quilt8 Comments on The Round the Year Quilt – First on the Finishing Line! What do you do when you cannot sit on the sewing machine and do some quilting? 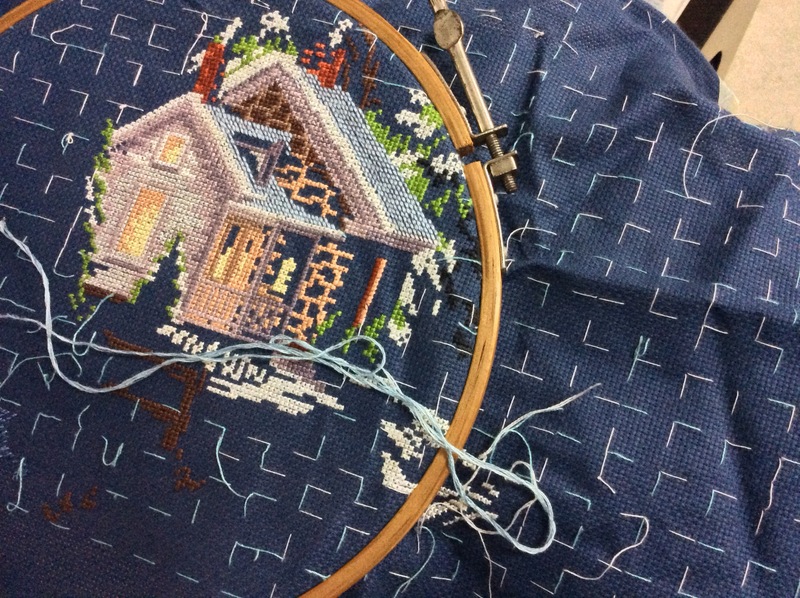 What a wonderful way to while away the long winter evenings… I only wish the background weren’t so dark, my ageing eyes find it difficult to count stitches!